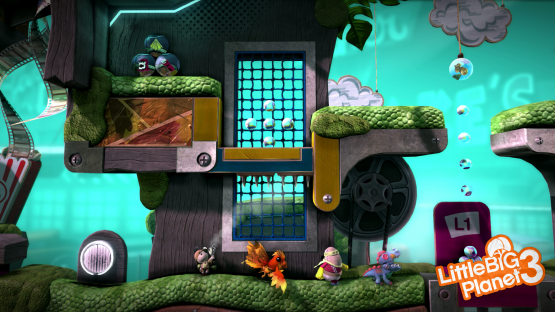 LittleBigPlanet 3 E3 Preview – Swooping Oddsock Sackboy! LittleBigPlanet 3 was a pleasant surprise for most people to come out of Sony’s press conference on Monday. While the game may not release until this November, it was playable at E3. After waiting in a relatively short line (which I can only assume is due to most people expecting this entry to be more or less like the previous two LBPs), I was assigned to a four-player multiplayer station. Player 1 was the traditional and iconic Sackboy, Player 2 was Oddsock, Player 3 had the role of the transformative Toggle, and Player 4 (that’s me!) got to play as Swoop. If you saw the level played on-stage during Sony’s E3 press conference, then you saw exactly what we played through. As Swoop, I was able to, ahem, swoop down and pick up any player I wanted. I messed around with a few of my teammates, but the level was short and it was over before I was able to throw anyone into spikes. I then played the level on my own, as Toggle. His ability is to change from a heavy form to a smaller form. The level tasked me with running away from a boulder in my small form, and occasionally using my heavy form to push a platform down. This would compress a spring, and if I then switched into the light form by pressing L1, the spring would launch me clear across the level. The lighter form of Toggle can also walk on water, which gave me access to areas normally out of big Toggle’s reach. Any sufficiently deep body of water could also act as an impromptu spring – use big Toggle to sink to the bottom, then switch to light Toggle to rapidly float to the top, where my momentum would propel me up out of the water and into the air. At the end of the day, this looks to be more of the same LittleBigPlanet we are familiar with, with a few more twists thrown in. While Media Molecule is not developing this game directly, it looks like they are consulting with Sumo Digital to ensure that the game looks, sounds, feels and plays like the real thing. From the time spent with the demo at E3, I can tell you that it does. The platforming is still a bit floaty, the control scheme is the same with some added functionality, and the slaps are still hilarious. Make no mistake, this is still very much LittleBigPlanet. I’m sure that I am not alone in hoping Stephen Fry makes a return as the narrator!